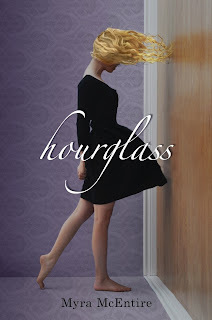 Book Review: Hourglass by Myra McEntire - fairy skeletons. So when her well-meaning brother brings in a consultant from a secretive organization called the Hourglass, Emerson's willing to try one last cure. But meeting Michael Weaver may not change her future, it may also change her past. Who is this dark, mysterious, sympathetic guy, barely older than Emerson herself, who seems to believe every crazy word she says? Why does it feel like an electric current runs through the room whenever he's around? And why is he so insistent that he needs her help to prevent a death that never should have happened? Hourglass was quite possibly the most original book I've read in a very long time. A really good book with strong, believable characters. I love the cover, too. Michael is a weird guy. He is overprotective and jealous, and some mention of his having a hero complex...? Yeah. I also didn't get... was Emerson pretty or something? Because why would a guy like him like a girl like her??? However, I really liked Hourglass and I'll be looking for the next book. 5 of 5.